Data-Gateway is an optional additional function in CCalendar. It has to be activated by your CCalendar administrator. In CCalendar you can display appointments from other calendar-systems by .iCal-Data-Gateway live*. All you need therefore is an URL to a valid .ical/ics-file or -script. This will be created easily at most calendar-systems. For including into CCalendar just navigate to the amin-menue-item "Appointment-Groups". Create an new appointment-group. Don't forget, to grant your users read-rights onto the new appointment-group. Ready! - As of now the external appointments will bi displayed in your CCalendar-views. * The URL will be requested cyclically max. all 15 minutes from the source. Tip: By this way you can include appointments of partner-organizations (which use CCalender independent from your organization) live* in your CCalendar-views! Therefore just let you create an iCal-URL (like discribed down at iCal-Data-export) from your partner-organization and include it by the described way here, into your CCalendar. With the iCalendar gateway you can unlock appointment data for other calendar systems (that also support the iCalendar format like e.g. MS-Outlook, Google Calendar, iCal, iPhone, Android, Mozilla Lightning, ...). Thus you can insert the selected appointments live into the other calendar system (mostly as an extra calendar sheet). 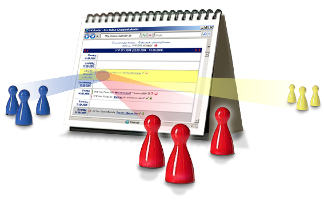 For that simply configure your desired appointment selection under the menu item "iCalendar" and copy the displayed URL respectively to the target calendar system. How often the target calendar system is reading the data from CCalendar is a matter of the displaying system and may be configured there. However, note that a maximum of 10 updates per hour are possible per user. Also note that this is a subscription-gateway (unidirectional) - no synchronisation gateway (bidirectional) - this means you can see all subscribed appointments from CCalendar in the target calendar but cannot manipulate (add / edit / delete) them. You can also find an implementation guide for several frequently used systems under the menu item "iCalendar" when logged into CCalendar. Single appointments in that way, can also be transferred to other systems. Therefore simply click on the link "Download as iCalendar Entry" in the appointment details and send the data to the target system that way. You can also retrieve a currently displayed appointment selection one-time in iCalendar format with a click on the link "iCal" in the appointment list and use it in another system. "We already use your CCalendar for a long time. We cannot imagine our organisation without it!"